If you're in need of parts and accessories for your John Deere Rear Engine Rider, you're in the right place. At GreenPartStore, we carry a huge selection of parts and accessories for all models of this useful vehicle. Our selection includes fuel hoses, ignition keys, spark plugs, mower blades, mower scrapers and protectant, and more. We have a vast inventory at our disposal and you are sure to find what you need! Start by clicking your John Deere Rear Engine Rider's model number below, or enter the part number in the Part Search Box above. If you don't see your desired part on our website, please contact us. 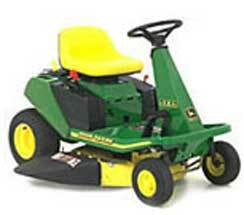 We can supply you with any John Deere vehicle part or accessory you need.